Find us at Camp Bisco this Weekend! Posted on July 17, 2015 by Matt Frazier / This entry was posted in Upcoming Events. Bookmark the permalink. We are vending Camp Bisco festival this year. Camp Bisco has since its inception been based at Indian Lookout Country Club in upstate, New York. Camp Bisco is an electronic and jam band music festival hosted and centered around The Disco Biscuits, a jam band from Philadelphia, Pennsylvania. Camp Bisco was launched in 1999. It was a time when both the jam band and electronic dance music scenes were taking off. Camp Bisco combined the sets of electronic DJs with improvisational rock bands, with the two scenes overlapping via bands like Sound Tribe Sector Nine (STS9) and the Disco Biscuits. 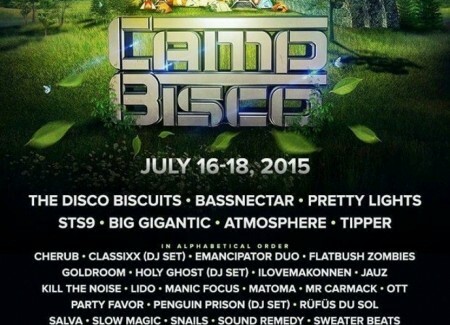 Camp Bisco has since expanded to include indie rockers and hip-hop artists, with acts such as Skrillex, Bassnectar, Amon Tobin and Big Gigantic performing at the 11th annual festival in July 2012. The Disco Biscuits (tDB) are involved in a number of charities. Each year at Camp Bisco they host a food drive with Strangers Helping Strangers to help the Duanesburg-Florida Baptist Church Food Pantry which is located right near the venue at Indian Lookout Country Club. The Disco Biscuits also raised charitable donations, through Camp Bisco, by offering tickets to people who made ‘generous donations’. The donations supported Hurricane Irene relief for upstate New York’s Schenectady County near Camp Bisco’s original location. In April of 2015, The Disco Biscuits announced that they would be moving Camp Disco outside of New York to Montage Mountain outside of Scranton, PA. The festival will be held the same three days -July 16, 17, and 18th. Mariaville County has expressed discontent with the festival, calling it an economic boon and citing injuries to a festival goer as a grievance against the production company in charge of putting the festival together. The band has expressed frustration with the county’s decision, stating that a couple of bad years is not enough to discount the five good years they have had in Mariaville and the fact that they have been working to reconcile the issues should have been enough to garner them the permits they were denied. But the efforts, which included a hefty insurance policy and a more prevalent police presence were not enough to convince the county. The band announced the news of the move to their fans in the form of a crossword puzzle, using words like ‘home’, ‘paradise’, and ‘Scranton’ to alert them of their decision. Scranton is known as the Electric City which is fitting for the band and the festival. Being close to home will also garner a lot more of the band’s core cult audience, making the move perhaps a blessing in disguise at least for the fans.